I didn’t intend to blog again until after Christmas but I just couldn’t help myself. Once I make a really good recipe, I have a hard time not sharing it immediately. And I definitely can’t help myself when it involves booze and chocolate. Last night I had a massive candy making session and had every intention of making some tasty dark chocolate peppermint bark. I spent that morning gathering ingredients but couldn’t find candy canes anywhere! I went on with my candy session and made tons of salted chocolate almond coffee instead (we will talk about that later). 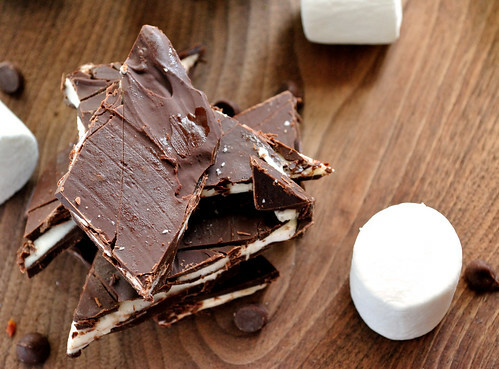 I was really craving some dark chocolate though and was determined to make some sort of bark, even without peppermints. They say that necessity is the mother of invention and last night, I think I proved that statement true. Since I was out of pretty much everything you would add to a traditional chocolate bark, I decided to wing it and make something different. I love the flavors of Mexican hot chocolate and I love marshmallows so putting the two together seemed like a great idea. Then I decided to add some booze because, well, chocolate and booze together just make me a happy girl. The result? 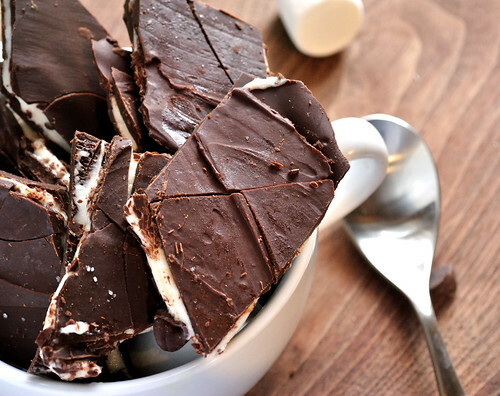 A kicked up dark chocolate bark with a layer of Grand Marnier marshmallow fluff that is nothing short of life changing. Oh friends, it is boozy chocolate heaven. I would say this makes a great gift to give to someone you love, but you may just end up wanting to keep it all to yourself. If you do decide to share, you will certainly bring some holiday cheer to your friends and family. Yields: one baking sheet full of bark! 2. Fill a large pot with an inch or so of water and bring to a slow simmer. 3. Set large glass bowl filled with chocolate the water. Do not let the bowl touch the water. You’ve just made yourself a double boiler. 4. Stir chocolate until just about fully melted, there should be a few whole chunks left. 5. Remove chocolate from heat and stir to finish melting all the chocolate. Your chocolate should be silky, smooth, and lump free. 6. Pour half of the chocolate over the parchment lined baking sheet. 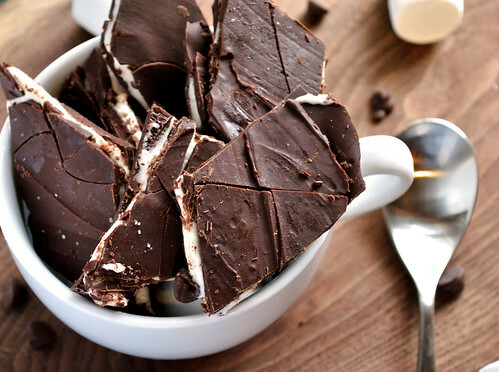 Use a silicon spatula to spread the chocolate into an even layer. 7. Place in the fridge or freezer to set while you make the marshmallow layer. 8. Add marshmallows and booze to a medium sized pot and heat over medium- low heat. 9. Cook, stirring often, until all of the marshmallows have melted and you are left with marshmallow fluff. 10. Once your fluff is done and your chocolate is set, pour fluff layer over chocolate. To do this, spray an offset spatula with cooking spray and spread around evenly. It’s going to be sticky but do your best. 11. Place bark back in the freezer for the marshmallow fluff to set. You want to the marshmallow layer to be firm but not frozen. You should be able to touch it with your finger without your finger getting sticky. 12. Once your fluff layer is set, pour the remaining chocolate and spread evenly. You want to work very quickly here since the cold fluff layer will start setting the chocolate immediately. Sprinkle with a small pinch of salt. 13. Place in the fridge or freezer to set. Once fully set, use a knife sprayed with cooking spray to cut into large pieces. Store in an airtight container with parchment paper. It will be sticky, but trust me, it’s worth it.